Over the past several weeks, Audi has been providing teasers and unveiling of the updated Audi A8 and S8 luxury sedans with Matrix LED headlights. There have also been several media leaks of the new MQB-based A3 Cabriolet. At the 2013 Frankfurt Motor Show (IAA), Audi officially unveiled the new A3 and S3 cabriolets, the A3 1.6 TDI ultra, re-introduced the Audi A3 e-tron Sportback and updated A8 and S8 sedans. Below are some of the highlights of each of the new or updated vehicles, with a selection of photos, announced for and on display at IAA 2013. When the MQB-based A3 and S3 models were announced in 2012 in the form of a 3-door hatch and a 5-door Sportback, along with the 4-door sedan, it wasn’t surprising that Audi would eventually unveil a new A3 Cabriolet. 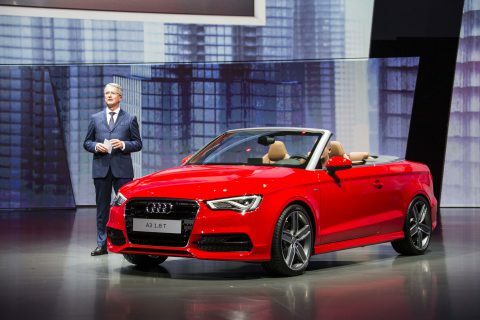 Recently, some of the details of the new A3 Cabriolet were leaked by a handful of media outlets before the official unveiling for IAA 2013. 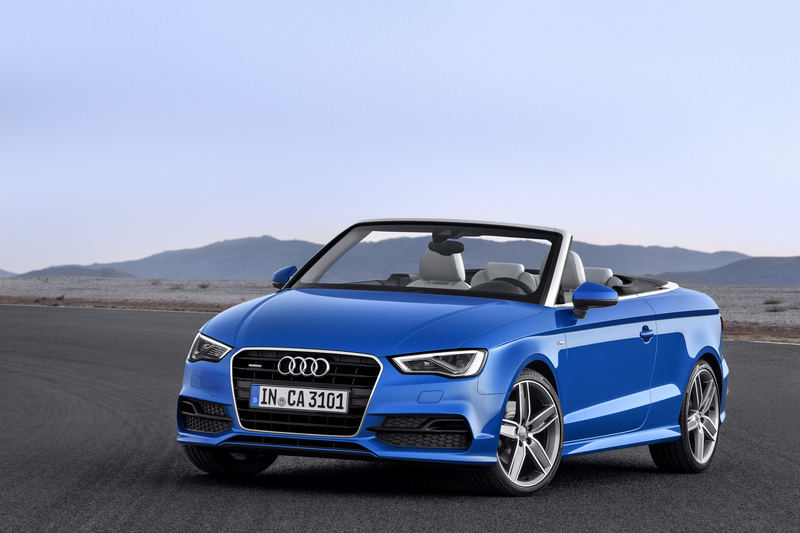 The new A3 and S3 Cabriolets carry on all of the styling cues that are found on the MQB A3 hatches, and add some unique elements to the Cabriolet. As with the previous general A3 Cabriolet (and all Audi Cabriolets, Roadsters and Spyders), the new A3 and S3 Cabriolet incorporates a folding soft-top. Moving the new Cabriolets to the new MQB architecture has afforded the same weight saving techniques (the A3 Cabriolet is approximately 110 lb (50 kg) lighter than the previous generation) of its hatch and sedan siblings; and, both will make use of same set of engines and S Tronic gearboxes. Adding the bits together, the new S3 Cabriolet will have a 300 HP 2.0 TFSI engine and a six-speed S Tronic gearbox. Even though curb weight is down, both the A3 and S3 Cabriolets have grown slightly in size: width goes from 5.81 ft (1.77 m) to 5.87 ft (1.79 m), overall length gains over half a feet from 13.91 ft (4.24 m) to 14.5 ft (4.42 m), and wheelbase now stretches to 8.53 ft (2.60 m). I would say there is a pretty good chance that we will see at least the new A3 Cabriolet arrive in the US, if not with the S3 Cabriolet. In addition to the A3 and S3 Cabriolets being unveiled at IAA 2013, Audi also announced a new A3 1.6 TDI ultra in both 3-door hatch and 5-door Sportback models. The massaged 1.6 TDI engine for the 1.6 TDI ultra makes 110 HP (5 HP over the 1.6 TDI for non-ultra models) and produces the same peak torque from 1,500 through 3,000 RPM. The engine is mated with a six-speed manual gearbox. By combining a massaged engine, some nipping and tucking, re-worked or additional aerodynamic bits and a ride height that is 0.59 in (15 mm) lower, the A3 1.6 TDI ultra now sips fuel at a rate of 73.5 mpg (3.2 l/100 km) and decreased carbon emissions of 136.79 g/mile (85 g/km). It would be a very safe bet that the A3 1.6 TDI ultra will not make it to the US, though we will be getting an A3 sedan with TDI when it arrives in 2014. 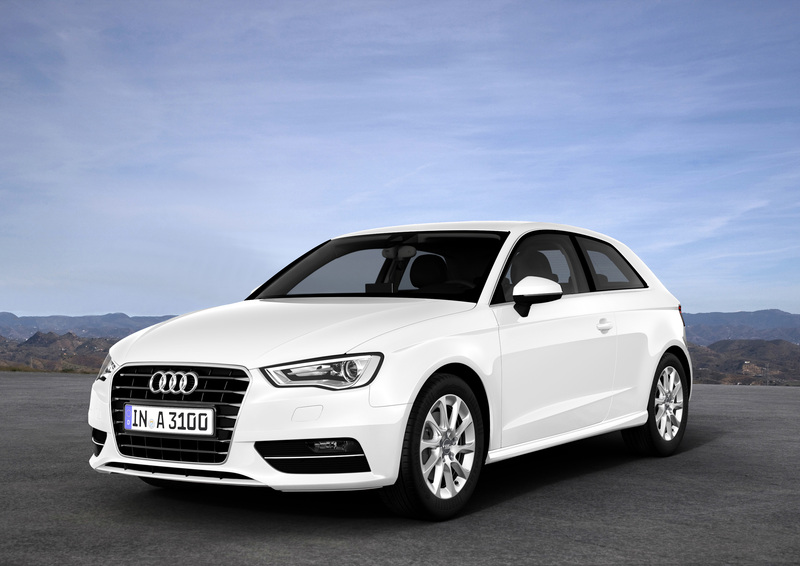 Deliveries of the A3 1.6 TDI ultra for the Germany market starts this month. Before I go into the details of the A3 e-tron Sportback, I was fairly disappointed that the US would not get an A3 Sportback when the new A3 sedan was announced. My mood was slightly lightened when I heard that it would return in some form. 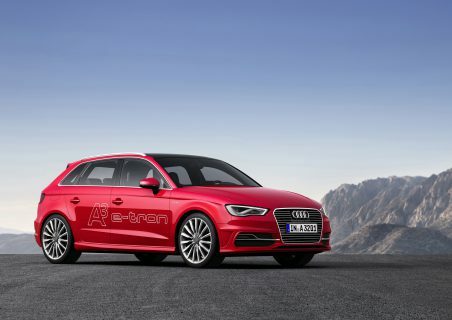 Well, it is coming to the US as an A3 e-tron plug-in hybrid. The A3 e-tron Sportback’s drivetrain, with its 1.4 TFSI hybrid setup, may initially look like a direct copy from the faintly-related Volkswagen Jetta 1.4 TSI hybrid. 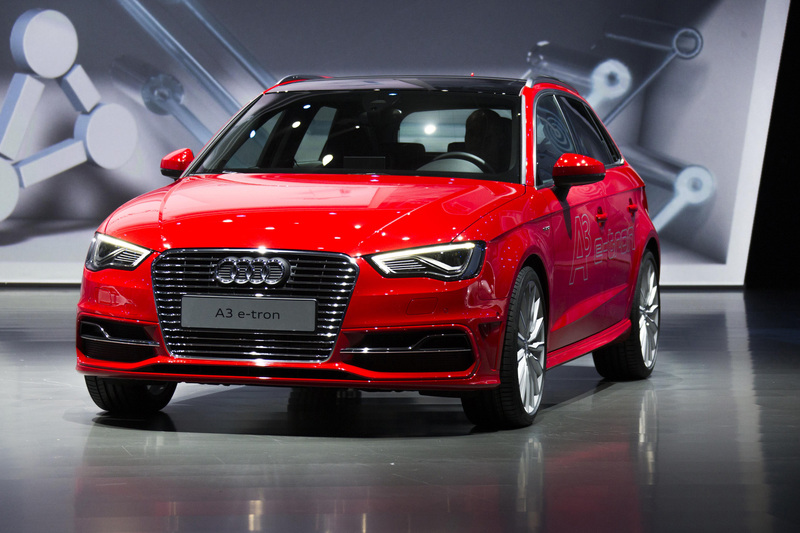 Even though the two may share the same core engine, the A3 e-tron Sportback is mated with a bespoken six-speed e-S Tronic gearbox with a 75kW (maximum) eletric motor sandwiched between the flywheel and the dual-clutch assembly. The combined output of both the petrol engine and the electric motor is 204 HP and 258 lb-ft of torque (not far off from the 2.0 TFSI petrol motor found in the B8 A4 sold in the US). The electric motor draws is juice from a 8.8 kWh battery pack and run up to 31 miles (50 km) while only consuming electrons and will total over 584 miles (940 km) on electricity and petrol (combined fuel consumption of 1.5 l/100 km, or 156.8 US MPG based on ECE standard). The whole battery pack and support system is comes in at 275.6 lb (125 kg). With the A3 e-tron Sportback’s drivetrain configuration, it should be able to dispatch 0-100 km/h in approximately 7.6 s (versus approximately 9.0 s for the lesser US-spec Jetta Hybrid). Although the A3 e-tron Sportback isn’t quite the new A3 Sportback that I would have liked brought over to the US, it will be the first plug-in hybrid (and only the second hybrid, behind the Q5 hybrid) that Audi will offer in the US. 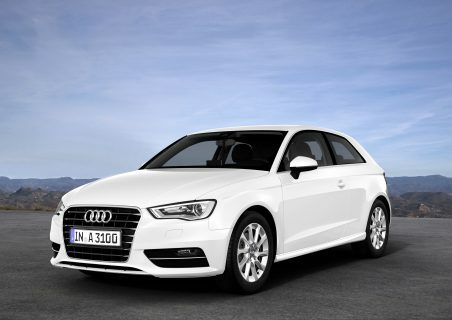 The Audi A3 e-tron Sportback should be available in German and European showrooms in mid-2014 and in the US thereafter. 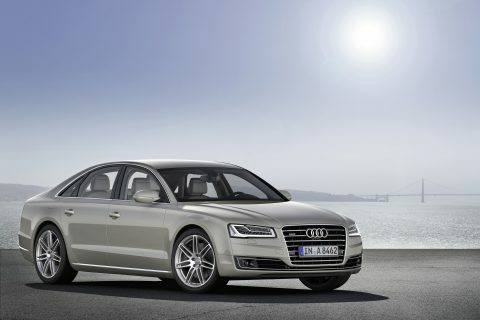 The D4 A8 sedans have been in production and on sale in the United States since 2010 and has seen a few changes, primarily in the form of drivetrain options (bespoken 4.2-litre V8 replaced with the 3.0 TFSI and 4.0 TFSI and the recent introduction of the 3.0 TDI engine for the US market) and various new options and packages. The S8 was introduced back in 2011, along with the (then) new S6 and S7 models, and came over as a 2013 model for the US. In August, Audi MediaTV teased, and later, pulled the covers off of the updated A8 and S8 sedans that feature a set of the new Matrix LED headlights (which will not be available in the US due to government regulations and restrictions). 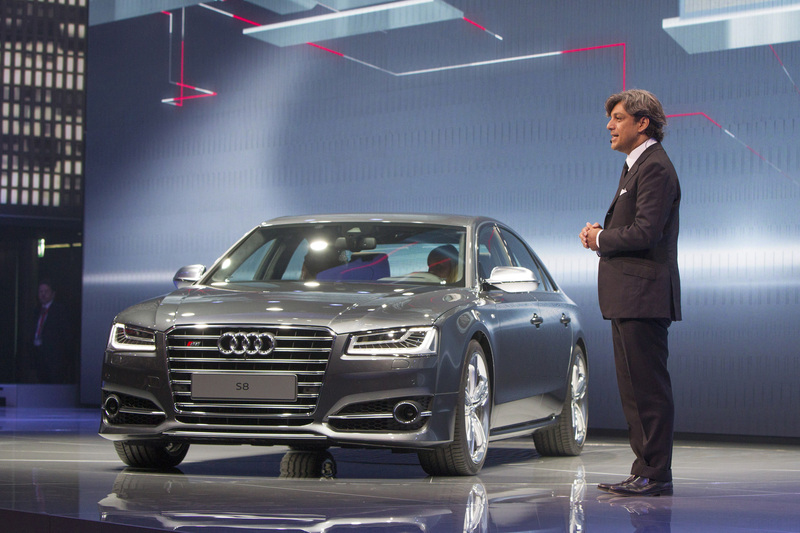 And now, the updated A8 and S8 have taken the stage at IAA 2013. Although the updated A8, A8 L and S8 will continue to run with the same set of engines, the performance on most of the engines have been nudged higher (for example: 0-100 km/h for the A8 4.0 TFSI has been shaved a tenth of a second to 4.5 s) by way of techniques and advances in reducing friction between engine components. The reduction in friction has also helped improve fuel efficiency and further limit carbon emissions. For the German market, the updated A8 line will start to be available in November. All photos used in this article have been sourced from Audi AG MediaServices.